Adenosine have been receiving focus in many researches of nowadays. It was found that adenosine acts in important chemical interactions in human beings and in mice models. Different subtypes of adenosine were based on pharmacology and signal transduction mechanisms, dividing in A1, A2A, A2B and A3 receptors. The movement control system and locomotor function, regulated primarily by the basal ganglia, are highly modulated through adenosine receptors. Some motor impairments, such as Parkinson Disease, have been treated using medicine based on adenosine. Nowadays, research tends to be deeper in some specific subject. Fortunately, researchers from many laboratories around the world have been investigating the effects of adenosine and its receptors in citoplasmatic membrane. Interestingly, adenosine has an important role in motor control. The aims of this research are to introduce the adenosine, explain its influence in modulate chemical interactions and shows how it has been used as a medicine in motor impairments. Adenosine is a molecule composed by a ribose sugar and the purine nucleoside. Adenine is a compound which is found in the adenosine, it’s made of a nitrogenous base, and together with Guanine, another nitrogenous base, their structure make them to be classified as Purines. This Purines are well known by their function in the DNA structure, making covalent bonds with Tymine and Cytosine respectively, a different kind of nitrogenous bases called Pyrimidines (Chandler & Colitz, 2006; Senft & LeVine, 2005). Figure 1. 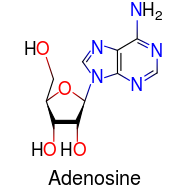 Chemical structure of adenosine. Adenosine also have anti-nociceptive effects such as inhibition of intrinsic neurons, leading to decreasing the release of substance P and glutamate, and inhibition the release of pro-inflammatory cytokines and chemokines (Essawy & Elbaz, 2013). In some situations when the enzyme xanthine oxidase is inhibit, the levels of hypoxanthine and xanthine may increase instead of being converted in uric acid. A medicine called Allopurinol has this inhibit potential and have been used as treatment of diseases like gout. In consequence, some of xanthine and hypoxanthine are converted in purines (Essawy & Elbaz, 2013). Among the four known adenosine receptors, which are A1, A2A, A2B and A3 (Gracia et al., 2011), the A1 and the A2A have higher importance in the central effects of adenosine (Ciruela et al., 2006; Essawy & Elbaz, 2013; Gracia et al., 2011). Despite of all of the four subtypes are found as a G-protein-coupled receptor (Gracia et al., 2011), they are differentiated based on pharmacology and signal transduction mechanisms (Hodgson, 2009). Receptors of A1 and A2A can be found both in postsynaptic and presynaptic location, and when they are stimulated they produce opposite functional effects, respectively decreasing of the probability of neurotransmitter release and enhance of neurotransmitter release (Ciruela et al., 2006). Figure 2. 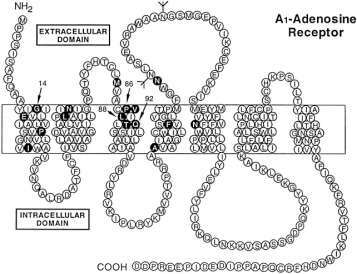 Representation of Adenosine Receptor A1. Regarding to nociceptive effects of adenosine receptors, it is known that A1 receptor produces antinociception, while A2A receptor is still being proved, but has some evidence of this same effect. The receptors A2B and A3 are not involved in these antinociceptive effects (Essawy & Elbaz, 2013). Researches in the central nervous system have been shown two predominant subclasses of adenosine receptor, which are A1 and A2. Both of them are coupled to G-proteins and acting in many important systems, such as potassium channels. A1 receptors are most found in the cerebellum and in the hippocampus, while A2 receptors in the striatum and olfactory tubercle (Schwabe, Lorenzen, & Grun, 1991). The adenosine receptor A2A mediates part of the interaction of adenosine and dopamine, involved in the regulation of movement and control of fine motor movement (Hodgson, 2009). Adenosine A2A have a selective role in modulating basal ganglia function (Jarvis, Jackson, & Williams, 1989), being highly found in the striatum, which is the main motor control of the Central Nervous System. One of the definitions adopted to describe adenosine is the term “neurotransmitter”. Neurotransmitter is a molecule which physiologically influences the electrochemical state of adjacent cells (Ferré et al., 2007). Then, adenosine also have been defined as “neuromodulator”, for its role in many brain function and processes (Ferré et al., 2007). Many neurotransmitters systems, such as glutamatergic, cholinergic, GABAergic and dopaminergic are modulate by interaction with adenosine (Hodgson, 2009). Recent studies showed that the adenosine has an important role in the motor control acting in the presynaptic mechanism. The activation of spinal astrocytes induces the release of ATP. Then, some extracellular enzymes converts ATP into adenosine, which binds to presynaptic A1 receptors on excitatory terminals of ventral horn. This process decrease the probability of neurotransmitter release, resulting in a tonic and phasic inhibition of excitatory postsynaptic transmission (Carlsen & Perrier, 2014). Figure 3. Representation of adenosine acting being released by astrocyte and acting in synapses. The functional relevance of knowing effects of ATP released from astrocytes in the ventral horn of the spine is to control of the involuntary movements or spasms caused by the hyperexcitability of motor networks. In cases of hyperexcitability, adenosine can act decreasing the activity of networks highly activated (Carlsen & Perrier, 2014). Researchers have been finding the effects of adenosine in promoting sleep, releasing neurotransmitters and regulating synaptic activity (Essawy & Elbaz, 2013). In order to apply all this knowledge in benefits to motor impaired patients, researchers have been trying to use adenosine as a medicine for helping the regulation of movements. Pharmacotherapies for Parkinson Disease are in different stages of clinical development and it includes adenosine A2A receptor antagonists, glutamate receptor antagonists, monoamine oxidase inhibitors, anti-apoptotic agents, and antioxidants such as coenzyme Q10, N-acetyl cysteine, and edaravone, and even viral vector gene therapy (Tarazi, Sahli, Wolny, & Mousa, 2014). A group of researchers that studied patients with Parkinson Disease, utilized an adenosine A2A receptor antagonist called Istradefylline was showed safe and effective as an adjuct to levodopa (Chen, Wang, Wei, Gu, & Wei, 2013). Writing this research was interesting to learn about the effects of adenosine. Being found in many parts of the body, adenosine has an important role in modeling neurotransmitters. This neurotransmitters are responsible in regulate motor control. Some research have been developed in treatment for motor control impairments. Parkinson disease are one of the impairments in focus, and investigations in the role of adenosine in the motor control are bringing benefits for patients with this disease. "The Role of Adenosine on Motor Control." UKEssays.com. 11 2018. All Answers Ltd. 04 2019 <https://www.ukessays.com/essays/biology/role-adenosine-motor-control-4685.php?vref=1>. "The Role of Adenosine on Motor Control." All Answers Ltd. ukessays.com, November 2018. Web. 20 April 2019. 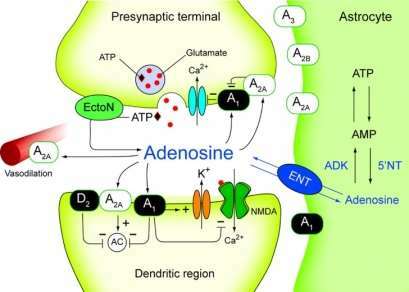 <https://www.ukessays.com/essays/biology/role-adenosine-motor-control-4685.php?vref=1>. UKEssays. November 2018. The Role of Adenosine on Motor Control. [online]. Available from: https://www.ukessays.com/essays/biology/role-adenosine-motor-control-4685.php?vref=1 [Accessed 20 April 2019]. UKEssays. The Role of Adenosine on Motor Control [Internet]. November 2018. [Accessed 20 April 2019]; Available from: https://www.ukessays.com/essays/biology/role-adenosine-motor-control-4685.php?vref=1.